As they say a picture is worth 1000 words. These pictures the visor roof line of the cab. Let me know if you need anything else. Thanks, kind of what I was afraid of, only the two holes. Same situation here. 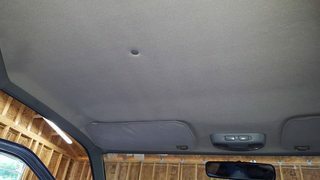 Need to recover my headliner REAL DAMN BAD. I still need to order some CLD, but the main holdup is trying to decide what fabric to use. What method did you use to clean the board? My headliner board is in fairly good shape. To clean it off did not take much effort at all. Itwas pretty much dust. I took a stiff bristled brush and brushed off most of the decayed glue and old backing. Shot it with some air and took #2 medium steel wool to get anything the brush didn’t get which was not much. My thinking was this would also rough up the surface for the new adhesive. Finally got around to putting up my sound deadner/ heat insulator mat. 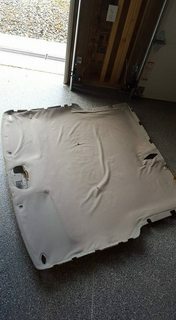 I got the X-Mat from Eastwood and man what a deference and I haven’t even got the headliner back in place yet. I have a '98 Frontier XE regular cab we bought with 100K on it in 2004. 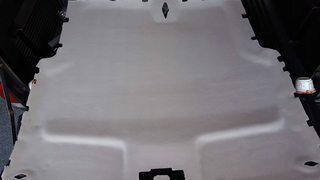 By about 2012 or so, the fabric had come loose from the cardboard "ceiling" and was basically resting on driver's head and obscuring vision. I saw some YouTube about gluing on some new fabric. However, I figured that all the plastic panels, being brittle from age and Arizona sun, would break when I tried to remove those to remove the ceiling cardboard. Anyway, what I ended up doing - as vehicle had over 200K on it by then - was pulling all the fabric off, brushing off whatever crap I could, and spray painting the cardboard gray to somewhat match the gray interior. Heard of the book "50 shades of gray" ? Well there's also 50 shades of gray spray paint available, made such match daunting. Anyway, for what that truck is used for, I'm OK with it, definitely some improvement. here's when I did mine earlier this year. only hard part was getting the rear quarter window plastic out without breaking them.